Adayanci Perez Chavez, who was separated from her father when they crossed the border from Guatemala more than two months ago, has watched as one playmate after another has checked out of the migrant children’s center in Michigan where they have spent their days studying, playing and meeting with their case managers. One by one over the past few weeks, 90 percent of the children at the center, managed by Bethany Christian Services in Kalamazoo, have been put on planes and reunited with parents who had been held at immigration detention centers across the country. “Yanci” was not among them, because there was no longer a parent with whom to reunite her. Desperate to get his daughter back, her father, Hugo Lionel Perez, said he had agreed to accept quick deportation as the price — except that when it came time to leave the country, he was put on a plane without her. As the Trump administration has rushed to reunite thousands of children separated from their parents under a “zero-tolerance” policy on border enforcement, it is now left with 700 or more cases that have been more difficult to solve, including those of 431 parents who were apparently sent home without their children. These are the cases that will continue to occupy federal immigration lawyers and immigrant advocates in the coming days, as federal authorities continue to unwind the effects of the policy that saw 2,800 or more children removed from their families in an attempt to deter the recent flood of migrant families from Central America. Despite having substantially met the court’s deadline for reuniting “eligible” parents and children, the Trump administration continues to face immigration lawsuits across the country, including a case in Seattle in which 17 states are challenging not only family separations, but how the government handles claims for asylum and the licensing requirements for migrant children held in detention. 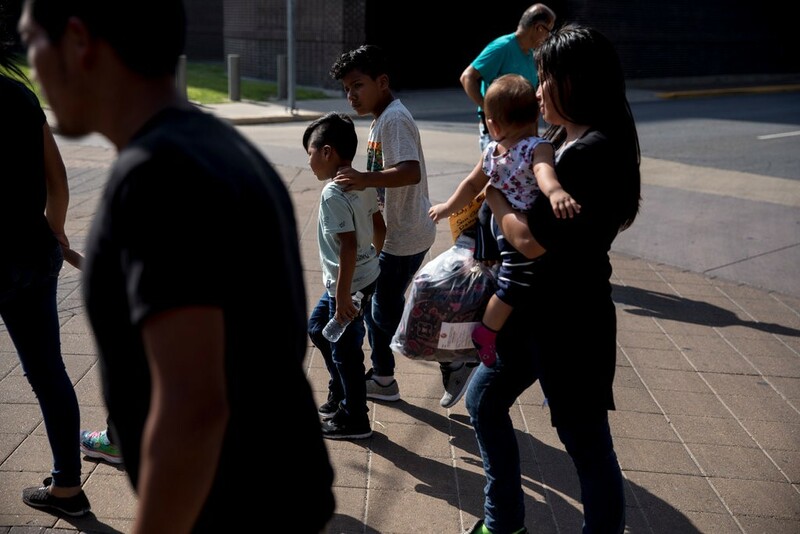 In Los Angeles on Friday, Judge Dolly M. Gee of the Federal District Court said she would appoint an independent monitor to evaluate conditions for migrant children housed in border processing centers and family detention centers where families can be held for up to 20 days. The judge said there was a “disconnect” in the assessments of conditions at the facilities between government monitors and the harrowing accounts of lawyers, health workers and others who have cited inadequate water, inedible food and other problems. “I think the court was moved,” said Peter Schey, president of the Center for Human Rights and Constitutional Law, who was a co-lead counsel in a 1985 lawsuit over the detention of migrant children, on which the current challenge is based. “I think this was an essential step in bringing the government into line with the terms of the 1997 Flores settlement that required the humane treatment of detained children and their proper release in appropriate cases,” he added. Judge Gee also issued a second ruling, which was preliminary and therefore subject to change, in favor of plaintiffs who alleged that migrant children in federal custody are routinely medicated with powerful psychotropic drugs, without giving informed consent. Adayanci Perez Chavez and her father were separated in May when they crossed the border after a journey from Guatemala. In the main case on family reunifications, Judge Dana M. Sabraw of the Federal District Court in San Diego signaled that he would likely rule over the weekend on a petition by the American Civil Liberties Union to further postpone immediate deportation of newly reunited families. Deportation orders are already pending against about 900 such families. In about 120 cases, said Lee Gelernt, a lawyer with the A.C.L.U., parents signed papers agreeing to be deported themselves without understanding that they were giving up the right to take their child with them. In such cases, most children are permitted to pursue their own petitions for asylum in the United States. Mr. Perez said this is what had happened to him. He said he and his daughter had been apprehended by Border Patrol officers in Arizona on May 12 and separated the next day. After that, discussions began about accepting what is known as “expedited removal” back to Guatemala. Lawyers at the Michigan Immigrant Rights Center, which is representing Yanci, said that they had received assurances from officials at the Office of Refugee Resettlement, which is responsible for children in government custody, that father and child would be reunited and sent home together if the organization did not pursue a separate immigration court case on behalf of the child. “An offer was being made and we agreed to it so that the reunification could happen as quickly as possible. But the promise was not kept,” said Susan Reed, managing attorney of the legal-aid organization in Kalamazoo, adding that the same scenario occurred in about five cases. “We were comfortable with a plan that got us the best possible result without the child going through a lengthy court process,” she said. Since the father’s departure in June, the organization has made three formal requests to the Immigration and Customs Enforcement agency to expedite Yanci’s removal from the country. Late Friday, Immigration and Customs Enforcement agreed that it would work with Yanci’s lawyers to seek voluntary departure before an immigration judge. The process could take several more weeks before she can be returned. Homeland Security officials have said that all the parents who were deported without their children made an informed decision to do so, and had agreed in writing to leave their offspring in the United States. In a court filing this week, the A.C.L.U. said that “evidence is overwhelming that parents have signed forms they did not understand,” including papers they thought stated that they wished to be reunified with their children. Some Central American migrants are illiterate. And many migrants from the highlands of Guatemala, where several dialects are spoken, do not speak Spanish. The A.C.L.U. cited several examples of detained parents who were confronted with documents to sign without understanding their content, and who sometimes did so under emotional duress. Among them were parents who had waived reunification when, in fact, they had wanted their children back, the organization said. The 1,878 children who were returned to parents or sponsors in recent weeks represent only a fraction of all those who were separated from their children after crossing the border, a practice that began last summer and escalated in May. President Trump issued an executive order on June 20 halting the separations after bipartisan outcry and global condemnation. Of the 711 children who were deemed ineligible to reunify, according to government court filings, 431 have a parent outside the United States; 120 have parents who waived the right to reunification; 79 have a parent released into the country who has not been found; 94 have a parent whose location is under “review,” 67 have a parent who raised a “red flag” and seven have been precluded from reunification by separate litigation. Immigrant lawyers working at family detention facilities and volunteers helping arrange shelter and travel for newly released families said Friday that reunifications had been plagued with chaos in some areas. He said that many parents were reunited with their children in a parking lot of the Port Isabel Detention Center. One mother was brought the wrong child. Some parents had to sleep in cars because they were released but their children were not yet there. Mr. Perez makes his living in Guatemala working in the corn fields and doing odd jobs. He lives with his wife and two children in a room in his mother-in-law’s house. His plan had been to head to Florida, where there is a large Guatemalan Mayan community, to work in landscaping until he had saved enough money to buy his family a home in their village. In Kalamazoo, Yanci spends her days at the migrant children’s center and her nights with a foster family. But she has exhibited increased anxiety as many of the children who, like her, had been separated from their parents began leaving. “She told me all her friends have gone with their mommies and daddies and keeps asking why she can’t leave too,” her mother, Alma Lucerito Chavez, said in a phone interview. The child’s caseworker informed her last week that Yanci had taken scissors to her hair in a fit of anger. “I talked to her today. She was crying, saying she doesn’t want to be there,” Ms. Chavez said. Her husband said that he had asked about his daughter right up to the moment he was boarding the bus to the deportation plane. Immigration agents told him they had no idea, he said. Siguiente artículo¿Quién es la mujer a quien Google le rindió homenaje el domingo 29 de julio?